In addition to the twin pygora doelings that were born on our farm, we have also adopted three Nubian kids within the past month. 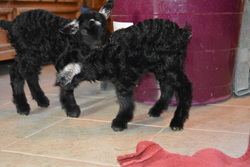 We adopted twin doelings and a buckling. Well, actually, my daughter adopted the buckling. He's just living on our farm and we are caring for him because she's in the US Navy and very well can't keep him with her. There is sooo much more going on around the farm, but I just don't have time to share it all right now. I'm afraid that I'm just not very good at blogging as it requires more commitment to computer time than I'd like. Hmmm, well, back to living life fully! I seek peace of mind and the ability to release the stress, frustration, and pain when I come upon a situation where I have no influence and my actions can not impact the outcome. I seek the strength of heart, focus, and determination to push forward and make a difference when I have the ability to do so. I seek the guidance and clear foresight to truly understand where my energies would be spent in the most beneficial manner. I seek balance in all aspects of my life where work brings forth rewards, rest provides renewal, lessons learned saves heartaches, and love abounds. As ya'll know I love Nature. I love the trees, the earth, the blue skies, & the birds that dance in the wind. Yesterday, my hubby added another magical element to our little farm when he put up our purple martin house! I am really looking forward to watching the graceful birds soar through the sky and make their homes in this little house that we provided for them. Purple martins are a very valuable resource on our all-natural farm. You see, they are very efficient at managing flying insect-pests like junebugs, cicadas, grasshoppers, and biting flies. We've placed this house over our garden area in hopes of attracting purple martins that will reduce the destructive bugs around the garden. Some other farms manage these types of pests with pesticides, but we believe that Nature will provide her own solution as long as we work with Her. So, when we provide a good home for the purple martins, they will manage the flying pests. We are grateful for this balance. As I'm trying to work with Nature as much as possible, I still must turn to more knowledgeable resources for guidance. As such, I'm finding this website: http://www.purplemartin.org/main/mgt.html to be very helpful. I will be working on following their guidelines, monitor my successes, and adapt to the particulars on my farm. In my art-world, I've been steadily preparing some bisque-ware for my next firing. I'm hoping to run the kiln again on Wednesday and will post new pics after I open it. These pieces in this pic have not yet been fired. In fact, the smaller one doesn't have all its color applied yet. When I wander through the woods enjoying Nature in all her amazing beauty, I observe that she doesn't create with opaque colors. Her colors are so intensely varied with highlights and shadows, and variation between bright, vivid hues to soft, subtle shades. So, as I strive to compliment her work in my own creations, I also avoid simple, opaque colors. I spend extra time and effort applying colors, washing them back, adding accents, and blending to create depth and natural shading. Time becomes irrelevant as the desired effects become my priority. I hope to see many, many wonderful people there! I welcome our visitors to our new website. I will strive to share as often as possible the ongoing adventures of this little farm, including my artistic endeavors in my pottery, jewelry-making, and fiber arts. Please check back on this page for all the latest happenings! I believe in living my life as fully and naturally as possible without bringing harm to myself or others. I believe in the magic of Nature and strive to respect Her in all that I do.